Have you been to the Grand Canyon of Pennsylvania? The Pennsylvania Grand Canyon in its Autumn beauty. 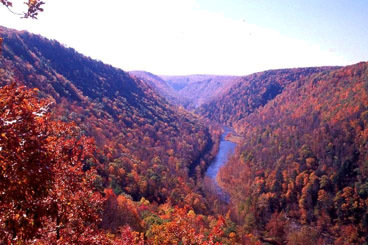 The PA Grand Canyon Often referred to as the Grand Canyon of Pennsylvania and the Pine Creek Gorge, the PA Canyon area stretches for over 45 miles with depths of nearly 1500 feet. It’s dynamic topography creates many scenic wonders, including steep canyon walls and waterfalls. The PA Grand Canyon is part of the Tioga State Forest, beginning just south of Ansonia, PA, near Wellsboro in Tiago County. With numerous developed trails the Grand Canyon of PA is a hikers paradise. Year round activities include floating, boating, fishing, hiking, and biking are all part of the area’s available outdoor recreational opportunities. The Pennsylvania Grand Canyon State Park areas display spectacular views. Colton Point on the west rim and Leonard Harrison on the east rim of the canyon are the “must see” vistas to visit. Camping and picnic areas are also available here as well. One of the most popular areas to visit in the canyon is the Pine Creek Rail Trail, a converted railroad bed that travels along Pine Creek at the floor of the canyon. USA Today cites the Pine Creek Rail Trail as one of the ‘Top 10 Great Places to take bike tour’ in the world. Due to the gentle grade, the trail offers easy peddling, hence it can be experienced with minimal physical impact and basic biking gear and experience. Why not add this bike trail to your biking ‘bucket list’? Come experience the Pennsylvania Wilds, and enjoy the beauty of route 6 which traversed the top half of the state. You will not be disappointed in the Autumn beauty of this particular region of Pennsylvania. This entry was posted in Camping, Family Vacationing, RV, RV Lifestyle and tagged biking, boating, camp, Camping, Family, fun, Grand Canyon, hiking, Lerch RV, PA Grand Canyon, Pennsylvania, Pine Creek Gorge, Pine Creek Rail Trail, RV Dealer, Rving, Tioga State Forest, trip, USA Today, weekend. Bookmark the permalink. ← Apple Crisp the right way!